I love to laugh, and as anyone who knows me knows, I love to make others laugh as well or at least smile. It probably started as a defence mechanism for me - I learned early on in life that even through my shyness I had the ability to make people laugh. I remember being referred to as the joke telling machine on the schoolyard in elementary school, and making one of my camp counselors double over with laughter as I explained the life cycle of a mosquito somewhere in my early adolescent years. Now let's face it, there is something fun about watching people's reactions to humor, especially if its gently self depreciating, or if its a terrible pun. However, humour can also accomplish something very important. 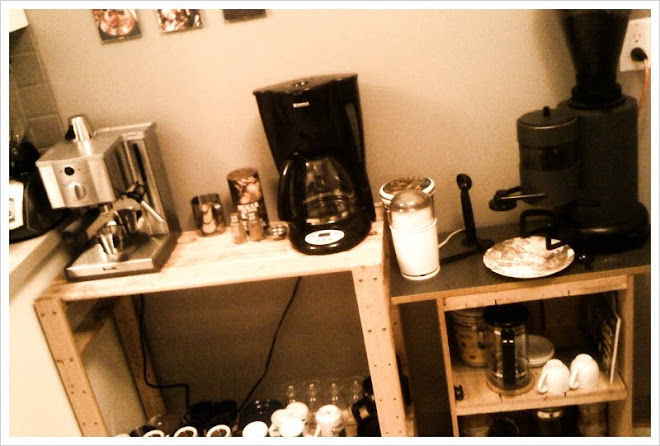 It can put people at ease very quickly. I had a conversation with a friend once regarding their slight disapproval of a way they had seen humor used in church by someone sharing a testimony. The point made was that the person had very good things to say and didn't need to use jokes to make the point. The more I've reflected on this argument, the more my thoughts go back to scripture and how Jesus especially used humor. As Jesus responded to the Pharisees' critique about cerimonial washing he said the following. "Blind Guides! You strain your water so you won't accidentally swallow a gnat, but you swallow a camel! "(Matthew 23:24 NLT) A camel? Let's try this in Winnipeg terms... "You strain your water so you won't accidentally swallow a mosquito, but you swallow a horse!" Can you envision someone trying to swallow a horse without laughing at the thought? How about this one? "And why worry about a speck in your friend's eye when you have a log in your own? "(Matthew 7:3 NLT) Can you imagine Jesus delivering this deadpan? You see, Jesus had good important things to say- more than anyone who lived before or will live after, and yet He used wording that would grab attention, and maybe even cause a smirk, a smile, or some outright laughter. As I said already, laughter has the incredible effect of putting one at ease no matter what the situation. When someone has genuinely made you laugh, your relationship with them is forever changed, and this can be a beautiful thing. Now I want to be clear - I am not advocating that a sermon be a comedy routine. Just as there are times to be funny, there are times to be serious, and the Gospel, the Good News of Jesus Christ is a serious and important message. So is the reality of sin and our need for forgiveness. Like anything else, there are appropriate and inappropriate times to use humor when sharing the word of God. This however is a skill that is learned over time and must be used with the knowledge that everyone will not be pleased. It also must be prayerfully considered that making people laugh can have the effect of bringing glory to oneself instead of God, and one must humbly and prayerfully consider this temptation in preparation. 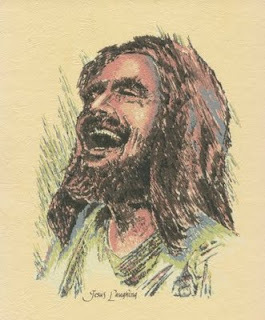 In all my years at my former place of work there was a drawing hung on the wall of Jesus laughing. 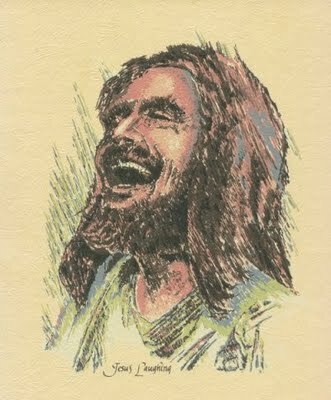 As the one through whom everything was created, He is the creator of laughter. Is it not then appropriate to honour Him with it?